A despairing man should have the devotion of his friends, even though he forsakes the fear of the Almighty. But my brothers are as undependable as intermittent streams as the streams that overflow when darkened by thawing ice and swollen with melting snow, but that cease to flow in the dry seasons, and in the heat vanish from their channels. Job’s friends started out doing just what that young man did for us. They sat with Job and wept, but then they just couldn’t stand it. They had to figure out why Job was experiencing such devastation. His pain rocked their theology. If this could happen to Job, an outwardly righteous man, then it could happen to them. Job’s friends are a perfect example of why theology is important. Their incorrect view of God shaped their response to Job’s losses and grief. They believed that if you obeyed God, He owed you. You wouldn’t suffer. Sounds like the prosperity gospel of today. They were like the teachers of today who exhort a hurting person that they need more faith or need to confess hidden sin. Chuck and I experienced that kind of “comfort” from a person who believed she could heal our grief by laying on hands and praying for us to have enough faith. Her skewed theology caused more pain than help, like Job’s friends hurt him. Job wanted his friends to stand by him, even if he “forsook the fear of the Almighty.” Even if he asked why or pounded on God’s chest and wailed in agony, Job needed his friends to sit with him and encourage him to trust God with his grief. Instead, they chastised him and challenged him to remember whatever evil he had done that caused such horrific losses. When your friend expresses her bitterness or questions God, don’t feel compelled to answer her. God is not afraid of her questions. He is bigger than any of them. Like a terrified little child running to her daddy, she can run to Him with all of the doubt, anger, and fear. She can crawl up into His lap, feel His embrace, and beat on His chest while He holds her tightly in His grip. Like a little child, she can slump exhausted into the safety of His arms as unconditional love flows from His heart to hers. Perhaps you are that one who needs to run to your Father and pour out all of your anger and fear and grief and doubts. Such dependency on Him draws you to His heart and deepens intimacy with Jesus. When you have no answers for your friend or yourself, acknowledge your own confusion, lament before the Lord, pray transparently, trust that He is holding you tightly in His grip. If your friend does not know Jesus, pray for the Holy Spirit to open her eyes to His love and grace. As you enter the darkness with a friend, you will share her questions and doubts. You will most likely ask the same questions. God is not afraid of your questions. He is bigger than any of them. Recognize that there are some questions that will never be answered adequately and there will be a time when you will need to focus on what you know about God, rather than on what you do not know. Pray as you visit, that you will know when your friend needs more help with her questions than you can give her. Oh Lord, we plead for mercy as we walk with broken friends and family. Show us how to be sources of life-giving encouragement, dependable places of help and hope because of Jesus. Autism. . . a term many are not familiar with. 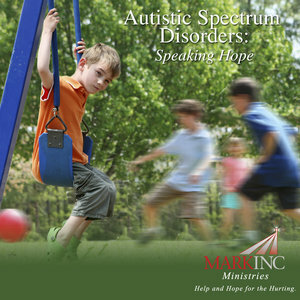 . .
How has having an autistic child affected your marriage or other children? What did people say or do that wasn’t helpful? What did people say or do that was helpful? What about the church? What can church families do to help families with autistic children? What would you as a father of an autistic son say to a father who has just learned his child has autism? What would you as a mother say to another mother? And much more. This interview will speak hope and help to families with autistic children. It will also help equip others to come alongside of these families and help them walk this pathway with hope.